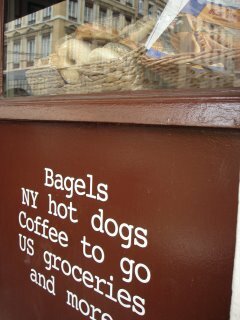 Some Saturday mornings we get ourselves together and trek up to near Place Terreaux, to Lyon's only bagel shop, a little place on Rue d'Algerie called Best Bagel (see pic with English sign). 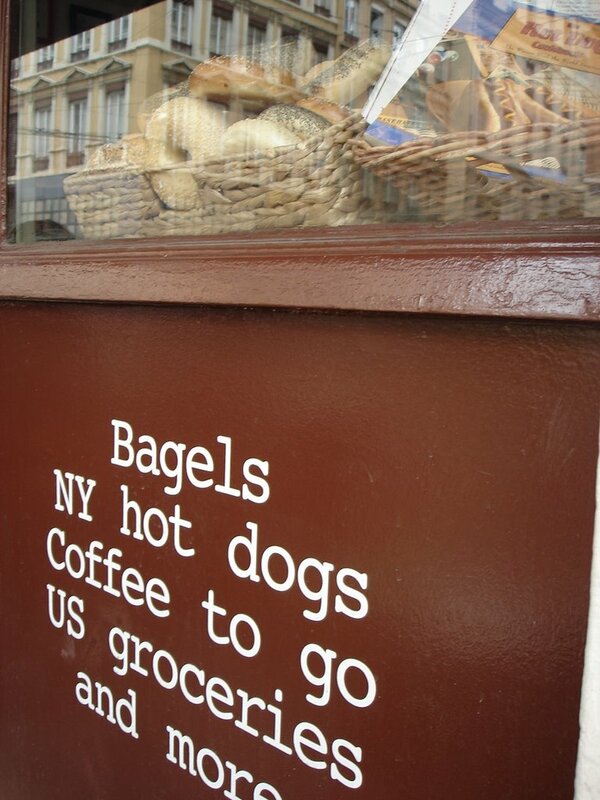 Now, I didn't grow up eating bagels, but I had some pretty good ones in Pittsburgh's Squirrel Hill, topped with lox and served by guys with sidelocks in funny black hats. Best Bagel doesn't have that kind of Red-Sea-Pedestrian cred, but the bagels are fresh, and they have honest-to-Jehovah Philly cream cheese, which they'll sell you by the gram to take home. But we don't just come for the bagels: This is also the only place in Lyon to buy Dr Pepper. Sure, it's 2 Euros a can, but I'm worth it. As the "US groceries" on the sign implies, there's also a small selection of American goods: Froot Loops, Crisco, Miller High Life, Betty Crocker cake mix, Twix bars. For V., the attraction is equally filled with artificial flavors and preservatives: On a table by the window is a stack of the fairly-recent trashy gossip mags (People, Us, Entertainment Weekly) she used to flip through at the gym back home. Boog and I have bagels and Dr Pepper, and V catches up on slightly-stale gossip she already knew about (Mel Gibson's bottle battle! Stinging heartache for Croc Hunter's wife!). If you squint, it's a little like Carrboro! Well, maybe if you close your eyes completely. And your ears. And don't sniff too deeply. You neglected to mention that the first thing V thought of for us to bring when we visit is a box of Cheerios. Even though your Tadpole has never seen the US, he's going to develop 'Merican food cravings too! Wait--they discovered it because someone complained about the smell? How on earth did anyone notice? Though it doesn't specify in the article (and I didn't read anything about it when it happened), I assume the botanical garden in question is the one at Parc Tete d'Or, where we go fairly frequently...well, V and the boys, mostly, while I'm at work. I've never been in the botanical garden because Boog always wants to go see the monkeys or ride the train or go get Nutella-covered waffles. BTW, our e-mail address is approximately "DonAndLilianRandall@gmail.com", only with our real names in there instead. Drop a line if you feel like it.